When hunting season is in full-swing, there is nothing more important than having the proper safety gear for you and your dog. Just as you know to wear a brightly colored jacket or vest for visibility, your four legged friend needs a bright orange dog vest to ensure they are easily seen, against any backdrop and in even the toughest conditions. 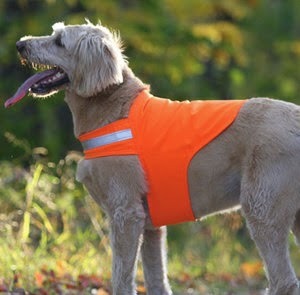 Whether you and your dog are heading out for a day of hunting or for your daily walk down the trail, a dog safety vest should be worn at all times as dogs are at an even greater risk of accidental injury as they can be easily mistaken for a deer or other game. 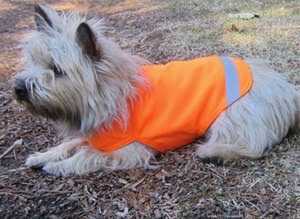 Dog Not Gone is a Maine-based company that makes superior quality safety vests for dogs designed for durability, fit, comfort, and foremost, safety. There is simply no better product like this available on the market. Their vests are manufactured using American made 10 Mile cloth and features their exclusive double Velcro closure to ensure the vest fits perfectly and won’t come off even in the thickest cover. Each of the styles available has a 3M reflective stripe that glows brightly even in low light settings. 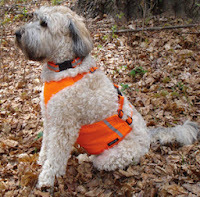 The original, the Safety Dog Vest is available in 7 sizes that can properly fit an average small size dog (30-40 lbs.) all the way up to a large, full size dog (85-120 lbs.). The Safety Pack Vest offers the high-visibility of the original Safety Dog Vest with the added benefit of two roomy side pockets with zip close to carry food, water, and any other gear you may need on your adventure. For the smallest nature-loving, adventure seekers! 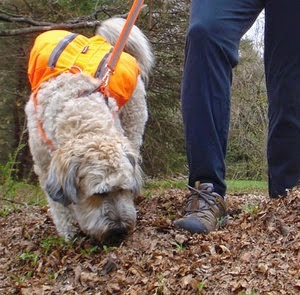 The Mini Safety Dog Vest offers superior visibility in daytime and low light situations to ensure even the smallest pups are safe and stand out against any background. The Mini Safety Dog Vest is specially designed for the build of smaller dogs so they are as comfortable as they are safe. The Chest Vest is designed to offer unrivaled visibility as well as superior chest and belly protection against scratches, abrasions and punctures that can occur from the toughest outdoor environments. This Safety Chest Vest features an extra layer of 10 Mile cloth for added protection.